Mary Robinson delivered the 10th Nelson Mandela Annual Lecture on 5th August 2012 in Cape Town South Africa. 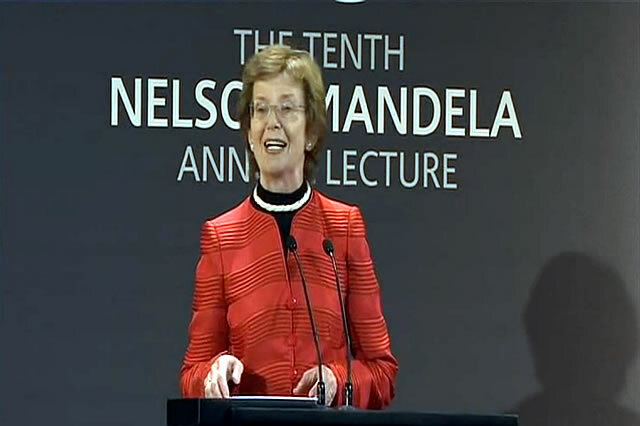 Mary Robinson delivered the 10th Nelson Mandela Annual Lecture on Sunday 05 August in Cape Town South Africa. Speaking as a ‘true friend of South Africa’ Ms Robinson said that as South Africa faced into its 20s, there was a great opportunity to draw on its strengths and renew the inspirational vision it set out of a rainbow nation, which the world stood in admiration of in 1994. “I have every confidence in South Africa realising the opportunities for its humanity to fully emerge,” she concluded.